Ok, so here she is. 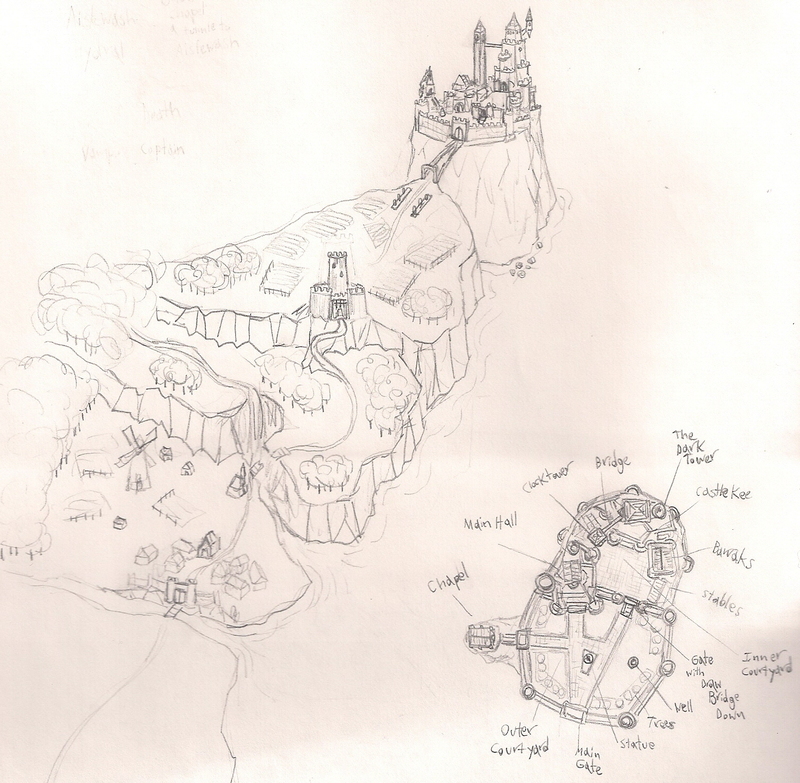 my fairly rough diagram of Losh Nekkar and the surrounding area (click the picture for a much better view) . I'm pretty happy with the design of the Castle itself but the nearby village and stuff needs a little work, but most important elements are visible. That's a bat's eye view of the castle in the lower right. Losh Nekkar is gonna be kinda of like a giant haunted house/fun house dungeon. All the classic horror monsters will be lurking somewhere nearby if not in the castle directly. The castle will certainly be the "tent pole" of the setting but there will be several other adventure sites located in the area. Much like Ravenloft or any of the games though the action will be fairly restricted, there is a sort of contained sandbox around the castle and a well defined border keeping the PC's trapped in the Count's blighted domain. More pictures and detail soon but feel free to ask questions or offer up ideas. I love that it's from a bat's view. Great castle. Thanks for sharing. Thanks Whisk! I'm glad that you like it. Yeppers. It's pretty darn cool. Keep up the great work. Oh wow, that is a great bird's eye map. Geez. now I'm going to have to draw something like that. You've inspired me!